In our busy world, people value things that are easy. We specifically look for ways to make life a little smoother, easier. It’s the reason we’ve got drive-through car washes and take-and-bake pizza. So when you encounter a store called “At Ease”, it imparts a sense of reassurance that your shopping experience is going to be, well, easy. That’s precisely the way the owners of At Ease, Linda and Ron Beale, want you to feel. At Ease has been a family owned business for 46 years. Linda and Ron purchased the store 21 years ago from the original owners, and have been building it into a success story ever since. There are two locations: one in Newport Beach, CA, and one in Scottsdale, AZ that son Don Beale manages. Retail was always something that Linda and Ron enjoyed. Both of them spent many years working together in retail before they purchased the business. Ron was Chairman of the Merchandising Board for Macy’s, and also Sr. VP of California Macy’s Board. Since owning At Ease, they’ve carefully cultivated an offering of both great clothes and great services. “You can say your store is this, or it’s that, but if you don’t have great service—forget it, you really don’t have anything,” Linda shared. 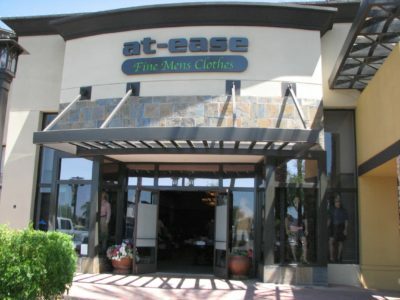 The customer service offered in the At Ease stores is what keeps people coming back. They’ve got over 40,000 customers that they’ve cultivated over the years, and there’s a reason why. “We cater to customers,” Steve shared. “We do special orders and really make our customers feel special. They are professionals, and they want professional clothiers helping them.” Ron added that the special touches that At Ease offers is what makes their stores unique. “We offer free gift wrap, free delivery, and same-day tailoring. That really sets us apart! We’ve got a full time master tailor at both stores,” Ron said. Steve acknowledged that the employees in their stores are instrumental in making the customer service exceptional, many of whom have been with them 25 years. He feels that they do an amazing job—with everything from helping customers in the store to follow through and connecting with the customers outside the store as well—and that it’s a key element to their success in a competitive marketplace. Linda is putting her design skills to good use. The Newport store is undergoing a renovation to its 7,000 square feet. “Customers like to see change. They like to see that you are staying up to date and relevant. It lets them know we want to make the shopping experience wonderful for them,” Steve told us. Making the shopping experience great means having the right kind of product in your stores. Many retailers have favorite items they love to sell, or items they think everyone needs in their wardrobe. For luxury menswear, oftentimes that points toward the classic suit, or maybe the dependable navy blazer. Linda has a more unique take on her favorite items: jeans and outerwear. She feels strongly that every man needs a great pair of jeans. “They’re so versatile,” she says. “Dress them up or down, a great pair of jeans works almost everywhere.” Her other favorite item—outerwear—is fun for her to buy and sell. “There are so many tricks to outerwear. It’s got a lot going on, it’s interesting. The fabric, the bells and whistles—it’s a unique piece of clothing,” shared Linda. The St. Croix Collection fits well into the At Ease stores. “It’s beautiful, well-made, people like it,” said Linda. “We’re very proud of being successful retailers and we’re proud of our beautiful stores.” Visit the professional and exemplary staff at one of the At Ease stores if you are in Newport Beach, CA (949-759-7979), or Scottsdale, AZ (480-947-3800). We’re sure that you’ll feel at ease when you’re there.